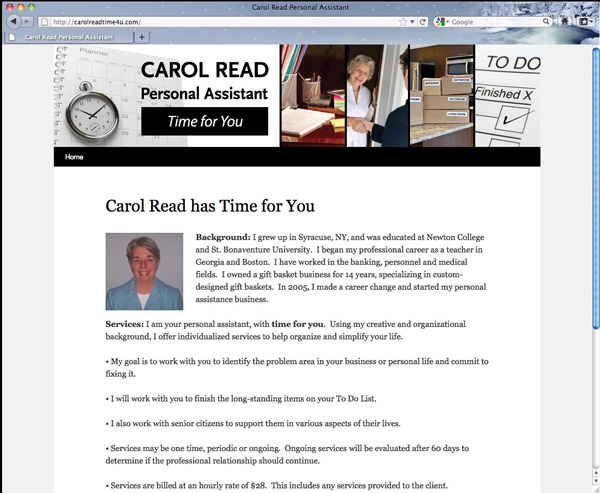 Carol Read was trying to grow her errands/concierge business, and knew that she needed to have a website at some point. When she was ready, she wanted a really simple, one-page website to start out. She didn’t have any existing graphics or logo, and needed this to be inexpensive, so together we created a simple logo and “look” for her new site. Of course, she also got business cards to complete her branding package, and she hands out those cards proudly!